At the end of the stay in Cairo, Station Rose booked time at Raja Rais´ "Midex Studio" outside Cairo, in Heliopolis. 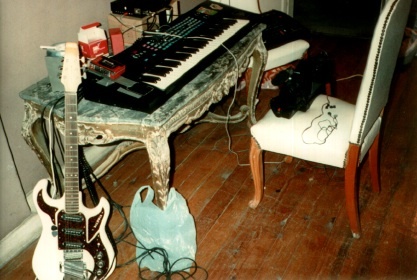 Danner played guitar, sampler (Prophet 2000) and drum machine (Oberheim DX), Raja Rais handled the recording and mixing procedure, and played organ on some tracks. Session musicians, who were present at the studio for other artists, were hired, as well as 2 tabla players Station Rose had heard perform at a nightclub in downtown Cairo. The following tracks were recorded and produced: "A La Kul Le Lun", "Wir Kinder von McDonalds und McLuhan", "Gunafa", "Ah Wag", and "A Fistful of Acid".